Monroe Ceramics brake pads are manufactured through a precisely controlled molding process that reduces resin content for more powerful, consistent and long-lasting brake performance. This Positive Molding Technology is the preferred choice of OE manufacturers because it leads to outstanding stopping performance. 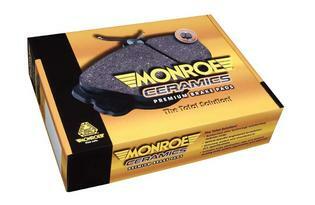 Monroe Ceramics brake pads feature true ceramic formulations that promote cooler, cleaner and quieter stops. All Monroe brake pads feature OE-matched slots and chamfers, as required, to reduce braking-related noise.